Today in the Sierra Nevada foothills residents enjoy some of the finest accommodations in the world. However, lodging was a different matter during the California Gold Rush.When goldseekers who came to California by sea landed in San Francisco, they found land accommodations even more primitive than what they had had aboard ship. Any shed was considered fit for a lodging house. Inside, miners might have found a line of bunks, often three high, along the sides. Bedding was not included. Many were glad to remain on board the vessel which brought them. Housing was even worse in the diggings. Most of the folks who finally reached the mines came with only a blanket or two, sometimes draping that humble blanket over a ridgepole as partial protection against the elements. More enterprising miners constructed crude frames of logs with canvas sides and roof. Caves and dugouts also provided some protection. Toward season’s end some miners built better structures of logs or split timber, and sometimes even added a field-stone fireplace and chimney. Typically, a canvas roof topped the mess.The winter of 1849-1850 was unusually wet. Being soaked to the skin much of the time didn’t help anyone’s temper. 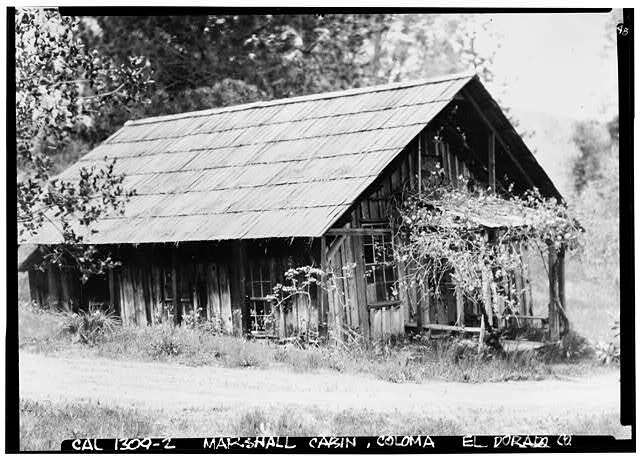 Some miners bitterly claimed that the rain fell faster inside the cabins than it did outside. One goldseeker wrote that he found some relief from the water leaking through the muslin roof by sleeping in a rubber cap, raincoat, and boots, with an umbrella propped over his head. “On rising in the morning,” he said, “the bottle was our first consolation.” Wrapped in their soaking wet blankets, they would sit around a fire of brush, holding pieces of pork on sticks over a smoldering fire or stirring flour and water together in a frying pan, and passing the bottle while they waited for breakfast. A single street with about 40 nondescript structurestents, “plank hovels,” log cabins and one unique edifice “formed of pine boughs and covered with old calico shirts.” The only two-story building in town was the imposing Empire Hotel, a strange amalgamation of wood and canvas which Shirley called “just such a piece of carpentering as a child of two years old, gifted with the strength of a man, would produce.” But because all materials had to be freighted from Marysville at 40 cents a pound, “this impertinent apology for a house” cost $8,000 to build. ...sometimes I am feeding my chickens and then again I am scaring the Hogs out of my kitchen and Driving the mules out of my dining room. you can see that anything can walk into the kitchen and then from kitchen into the Dining room any time day or night if they chooses to do so. sometimes I am up all times a night scaring the Hogs and mules out of the House. Last night there a large rat came down once down into our bed in the night...there I hear the Hogs in my kitchen turning the Pots and kettles upside down so I must drop my pen and run and drive them out. so you see this is the way that I have to write. jump every five minutes for something and then again I washed out about a Dollars worth of gold dust the fourth of July in the cradle so you see that I am doing a little mining in this gold region but I think it harder to rock the cradle to wash out gold that it is to rock the cradle for the Babies in the States. And on the road, accommodations could be even worse than the rude quarters the miners faced on their claims. John Ingalls wrote this letter from Hangtown on January 16, 1850. ...We started on the 18th three of us in Company & came on the way ten miles. It was so muddy that we were obliged to come very slow with our packed mules. The next day it commenced raining at about noon but we succeeded in getting 18 miles farther on our journey & stopped for the night at Mormon tavern. O how it rained that night. If we had had a tight roof I should have cared nothing for it but truly a respectable rail fence would have made a splendid roof compared to the one we had. We bought barley for our mules for the low price of one dollar a quart & a little cold tea for ourselves for two dollars each & then as we could not get within a rod of the fire we made up our minds to turn in & get warm. There was such a crowd in the house, the berths were all taken up so we had to spread our blankets on the ground, I should say in the mud for the mud was nearly ankle deep on the ground. We were obliged to cover up our heads as well as our bodies for the rain came down in torrents. I had just got into house when a man stepped square on to my head in getting into his berth. I should have thought that rather rough treatment at home but we don’t mind such little things in California. We got our shins stepped on several times with remarkably heavy boots containing a pr of feet not very light but aside from these little inconveniences we got through the night very well. Gold miner Steven Wing shared similar sufferings, with some unwanted night guests. March 20, 1852. Started for Ophir. All the buildings were light frames covered with clothexcept the gambling house, which even gloried in glass windows. Found our way to the New World Hotel, which was six posts in the ground, one post in the center of each end place, eleven feet high for the ridge pole to rest on, 2x4 scathlings for the plates from which a few rafters to the ridge completed the frame, which was covered with old foresails, gaff top sails, jibs, and odds and ends of drilling and canvas. The floor was always there, dirt, and had required nothing more than levelling and smoothing. A rough table thirty feet long, and two benches the same length constituted the sum total of furniture; excepting a liquor bar in one corner. It was very cold and Cook [Wing’s partner] and I talked another into sharing his coat. “How much account is three inches of hay and one-third of an overcoat over a person on a cold night?” The three inches of hay under us became less as the night wore on, for several mule teams arrived from the mountains late in the evening, and the mules were tethered all around the hotel, and after eating their allowance of hay, they put their heads under the sails and attacked our beds. Quite a number of the lodgers awakened in the morning with their heads on the ground, and one man lost a little hair. Rates here are thirteen dollars a week, payable in advance. Finally, after a few years, more and more women came to the mines as transportation challenges eased. Those guardians of civilized habits reformed a miner or two.